The UK government has suspended financial aid to Myanmar's military amid "ongoing violence" in the country, formerly known as Burma. Violence in the Rakhine state has seen more than 400,000 Rohingya Muslims flee to neighbouring Bangladesh. The Ministry of Defence said it had suspended £300,000 of funding until the current situation was resolved. The UN's human rights chief has said the violence "seems [like] a textbook example of ethnic cleansing". The £300,000-a-year was used to fund educational courses for the country's military. But an MoD spokesperson said: "In the light of the ongoing violence... and our deep concern about the human rights abuses that are taking place, we have decided to suspend the educational courses provided to the Burmese military until there is an acceptable resolution to the current situation." There have been reports that the state military have been burning down Rohingya villages. Earlier Myanmar's de facto leader, Nobel Peace Prize winner Aung San Suu Kyi, said there had been "no conflicts" in the region since 5 September and there had been no "clearance operations" for two weeks. But the BBC's Jonathan Head, who is reporting from neighbouring Bangladesh, said he had seen a village being burned on 7 September, and columns of smoke suggesting others had suffered a similar fate. Ms Suu Kyi has come under heavy criticism from the UN's chief Antonio Guterres, who said the she has "a last chance" to halt the army offensive. 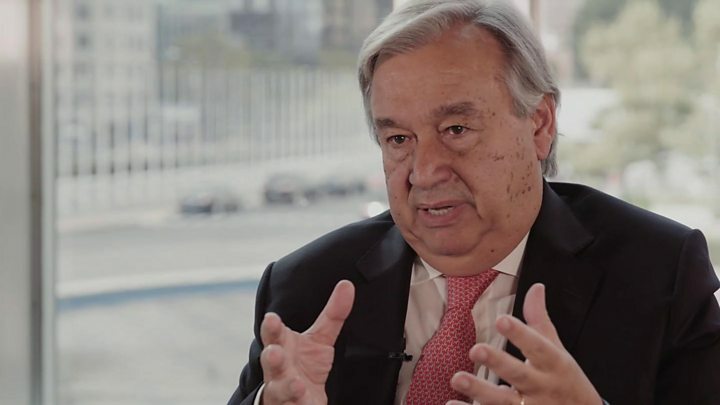 Speaking to the BBC's HARDtalk programme, the UN secretary general said it was clear that Myanmar's military "still have the upper hand" in the country. And the UN's human rights chief Zeid Raad Al Hussein said on 19 September that the security operation "seems a textbook example of ethnic cleansing", and called for an end to the "cruel military operation". Violence in the region began on 25 August when Rohingya militants allegedly killed 12 people in attacks on police posts. The attack was blamed on the Arakan Rohingya Salvation Army (Arsa). Since then hundreds of thousands of Rohingya Muslims - a stateless minority in the Buddhist-majority state Rakhine - have fled Myanmar for Bangladesh near the city of Cox's Bazar. 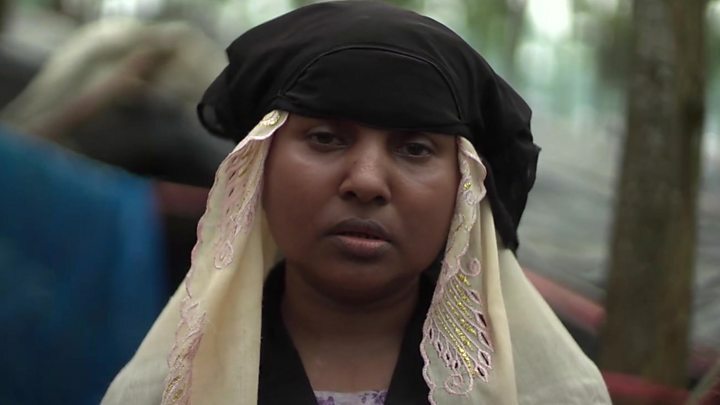 Rohingya's claim that they are being forced out of their villages by the state's military, whereas the state claims that the refugees and Muslim militants are burning their own homes. Read more on what sparked the violence in Rakhine. On Monday Foreign Secretary Boris Johnson said: "I have spoken to [Ms Suu Kyi] several times since this whole disaster began, and it is barbaric what is happening to the Rohingya, there can be no doubt about it. "I think, what everybody wants, we want the killing to stop, number one, and that's a message I've given her." Access to the Rakhine region is restricted by the state, meaning that journalists are only allowed into the area on government-controlled trips. In a speech to Myanmar's parliament on Tuesday, Ms Suu Kyi said Rakhine would allow refugees back in to the region, after a "process of verification". Rohingya Muslims are referred to as Bengali Muslim's by the government, and are denied citizenship and equal opportunities by the government.